Our first patron was Lord Alistair McAlpine, and his Perth home, Bishop’s House, was the lovely venue for our first fundraiser in 1988 where we raise $10,000. 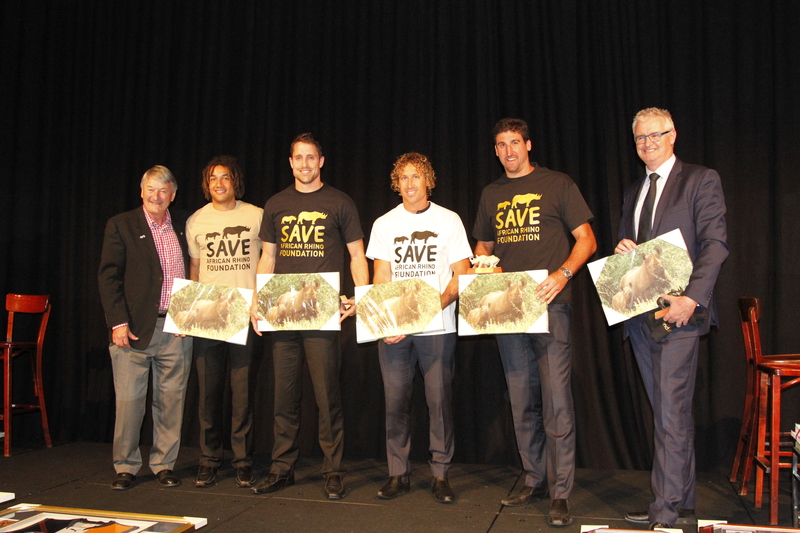 Since then, between events, donations and safaris, we have raised more than $10,000,000. 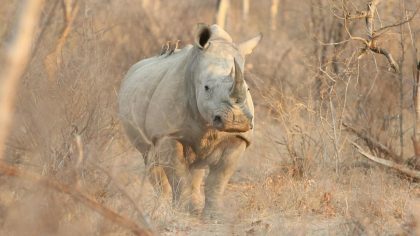 The vast majority being used to preserve Zimbabwe’s rhinos, many of whom would by now have been poached had it not been for our intervention with vital anti-poaching resources. Hello everyone and thank you so much for being part of our highly successful dinner auction last Wednesday at the Hyatt, all 380 of you. I’m now proud and happy to pass on this report to you all, so please take a few moments to read it. 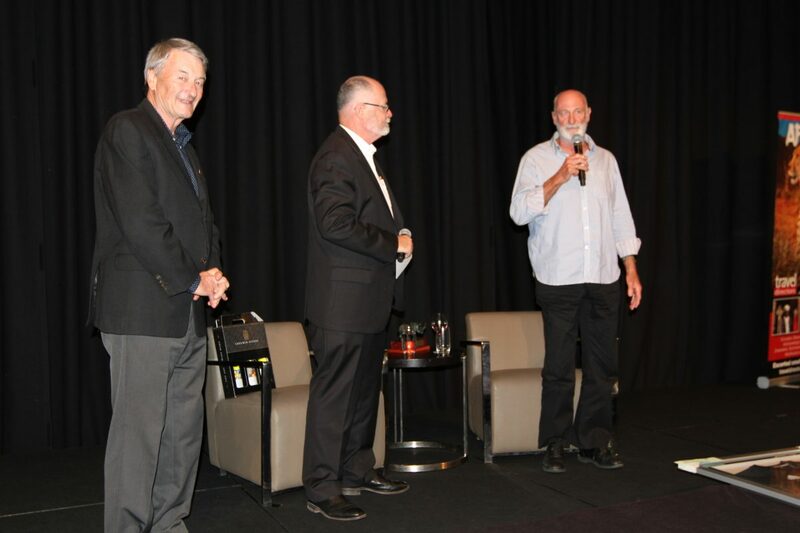 And a massive thank you to the great Dennis Lillee who enthralled us with his stories from the past, thanks to well researched questions from Glenn Mitchell. This was an outstanding conversation as evidenced by the attentive audience for all 50 minutes of their entertainment. 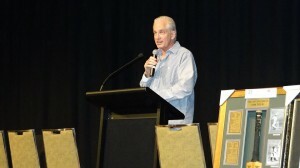 Most of the interesting aspects of Dennis’ great sporting life were touched upon with candour and humour. Thank you both for providing such an amazing experience for us all, it was terrific. 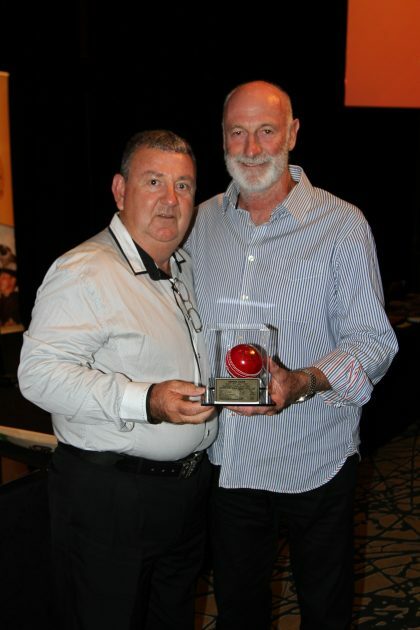 We started with a stroll down memory lane, reliving Dennis capturing his 248th Test wicket to equal the Australian record, then his next to break Richie Benaud’s existing record, then his 309th to equal Lance Gibbs’ world record, then breaking it with his 310th, and finally his 355th and last one in his farewell match. What sweet memories! Then we briefly heard from Jennifer Chester who had just returned from four weeks of volunteering in our biggest project, Save Valley Conservancy, and how blown away she was by the whole experience. This led into the recent Today Tonight story on the two big screens – wow, what vision. And then we acknowledged the major role that Ben O’Shea has made in the last few weeks, putting together the TT story and then featuring our various conservation stories exclusively for the whole week in his Inside Cover columns. He well deserved his rhino carving award. 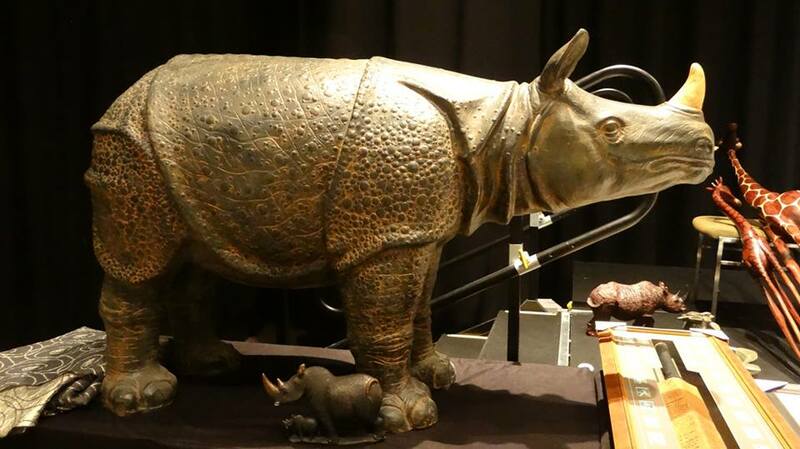 The main auction was preceded by a magnificent, award winning, song “Till you’re free again” and I’m copying it here so you can turn up the sound and play it again please; https://www.goodthingsguy.com/lifestyle/sa-award-songwriter-rhino-poaching/ It’s hard to keep a dry eye and I’m asking you all to please give a little more for the rhinos by going to this link, which issues your tax deductible receipt; And then watch it again, it’s so touching! https://www.givenow.com.au/savefoundationaustralia The rhinos are worth it! Our celebrity auctioneer, Tiny Holly, was the best I’ve ever seen him and kept things moving very efficiently and entertained the audience at the same. Thanks again, Tiny, and very well done. And thanks also to our main supporters of the varied auction items, Ann, Chris, Clive, Graeme, Jim, Marc, Nola, Shaun and Syd. As usual, our two main auction items were our two very splendid 13 and 8 day safaris, very kindly donated by the following wonderful supporters of Zimbabwe rhino conservation – Save Valley Conservancy and Sango Lodge, Malilangwe Trust and Singita Pamushana, Bubye Valley Conservancy, Amalinda Camp, Ivory Lodge, The Victoria Falls Hotel, The Hide, The Victoria Falls Safari Lodge and Jackalberry’s Chobe. The two lucky couples will have the times of their lives and they’ve both bought these auction trips before as they know how nice they are. Thanks everyone, again! Nia and Travel Directors were our main sponsors for the night and besides offering a full retail travel service for business and general, they are able to book absolutely anything you wish for, and also offer a very comprehensive range of small group tours to exciting locations all around the world. Their website is www.traveldirectors.com.au<http://www.traveldirectors.com.au> and is very worth a visit. To make the evening flow we were very lucky to have the most generous support of Andy, Sam and Night Harvest Wines with their delicious range of reds and whites. Further supplies can be purchased at $180 per case with free delivery, so please support them at www.nightharvest.com.au<http://www.nightharvest.com.au> . Thanks and much appreciated. Gage Roads beers were also very supportive and supplied Single Finn and Alby beers plus Hello Sunshine apple cider, from their boutique range – thanks guys. As always, Picasso Print & Design produced our colour catalogue for all guests, as well as our other printing work through the year, so thanks Gemma, Cobey and Iain for your ongoing kindness to us. Doris Brinkhaus donated some lovely gold and diamond earrings which now have a nice new home to go to, thanks Doris, and Primewest donated some holiday packages in the south west, thanks Jim. We had a great group of helpers on the day and night who worked tirelessly to make this all function as well as it did, led by Evelyn and Nia, and backed up by Cameron, Emma, Evan, Giles, Julie, Kate, Lorraine, Luke, Maree, Mark, Martin, Mike, Nelly, Oliver, Sacha, Sophie and Steve. Thanks everyone, so much! 1. Main auction – $103,775 after some last minute purchases. 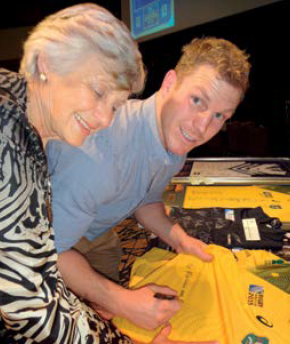 Our 2015 gala dinner was once again held at the Perth Hyatt Regency and the key note speaker was the hottest property in town, David Pocock. 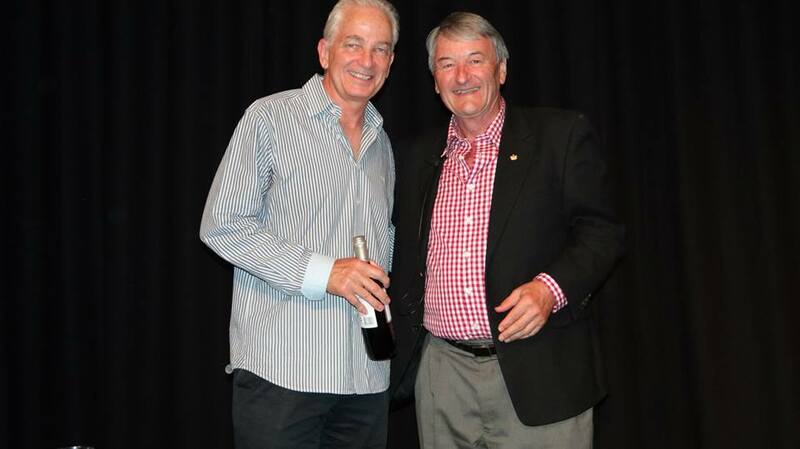 Nicholas had secured David as a patron of SARF in 2013 and had booked him in several months previously for this dinner, not realising that it was the world cup! 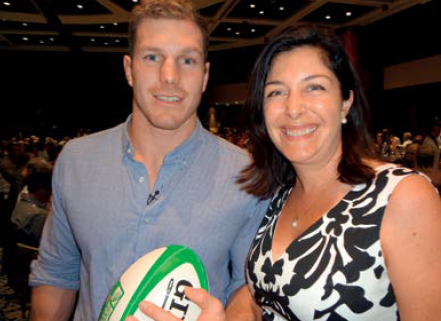 David was literally straight off the pitch of the Rugby World Cup final and at our dinner. He had been in every newspaper and on every TV for the past few weeks, and now he was at our dinner, passionately supporting SARF. We didn’t have one seat spare, and not only did we have a full house we also had two film crews present, Today Tonight from Channel 7 and the ABC, who were covering the whole event for Australian Story. We had a wonderful evening with our four celebrity AFL stars, Dean, Luke, Matt and Tendai, who were sensational. They generously gave of their time and energy to all our guests who spoke to them. 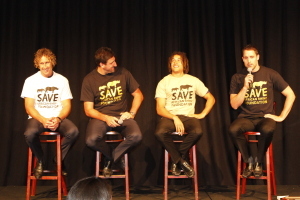 Thanks guys, and how honoured we were to have such nice young men as our special guests. As usual, Tim Gossage was outstanding with the panel show and kept things interesting and action packed. 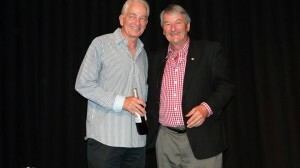 We are very lucky to have him as an annual supporter. We had lots of first time attendees at this event, thanks for coming along and hope you had a good time and will return. 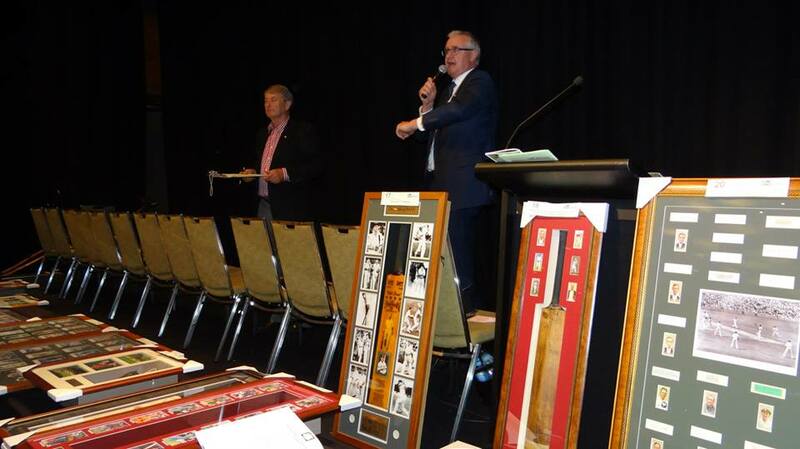 We raised a grand total of $160,445, which is a record amount for one of our dinner/auctions so thanks to all involved. 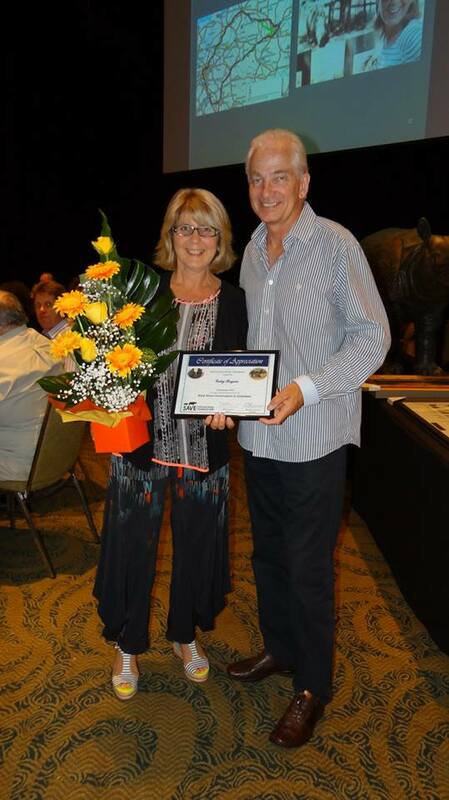 This was the first gala where we promoted our Rhino Ranger Support Scheme, which received a lot of support on the night. We were absolutely delighted to welcome 35 new members to our group on the nights. 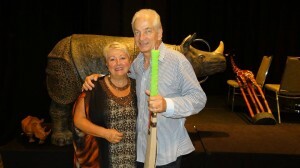 We have lost count of the number of SARF events David Gower has support since he became one of our patrons in 1993, and we were delighted to have him back with us for our 2013 Gala. 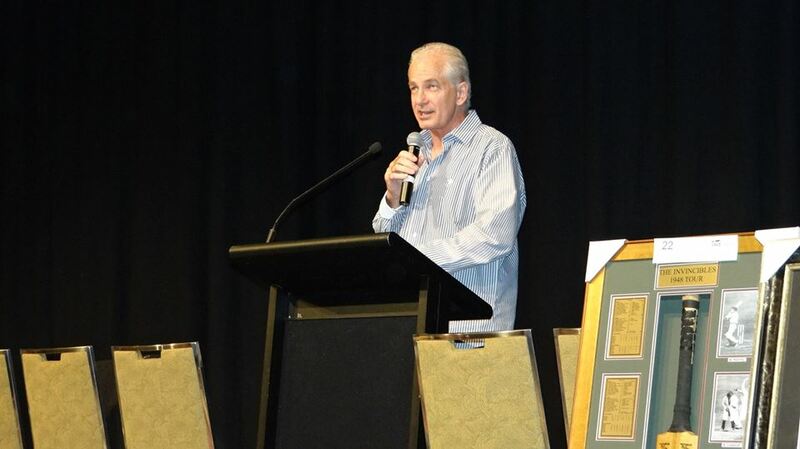 Thank you David for being such a wonderfully gracious, entertaining guest speaker and patron for the past 20 years. There were 452 members and guests in attendance at the Hyatt. 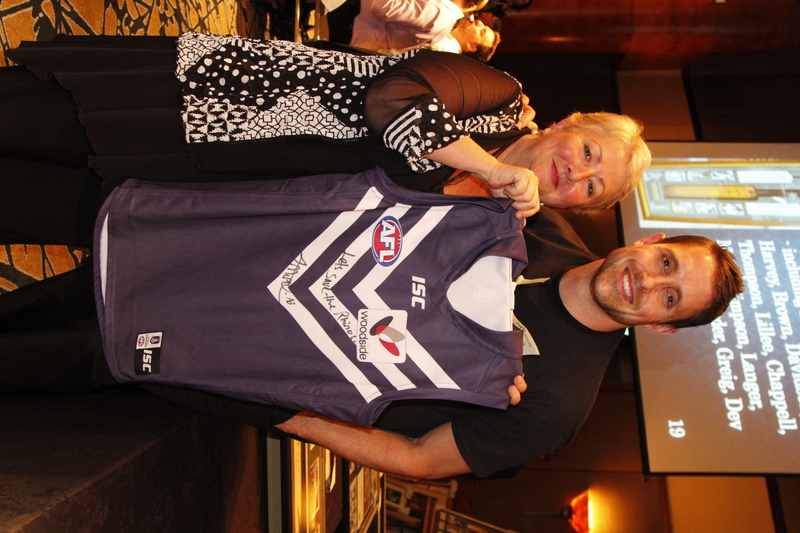 Of the 44 tables of ten, a whopping 26 were hosted by our members, an enormous effort – thanks so much. 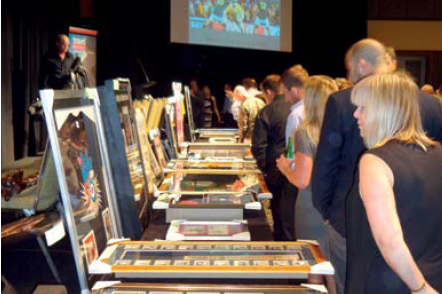 The event raised a total of $153,000, our best ever result to-date. Thank you everybody for the part you played.